Is certainty about religion and ethics a good thing? I’m not sure how seriously I take this story, but it is interesting – attempting to measure something intangible. How certain are writers about what they say about God and ethics? And how open-minded do they think they are? So I hope it’s worth a look. I have written previously about psychologist Jonathon Haidt, who believes that we make most political, ethical and religious judgments intuitively (by “gut feeling”), and then rationalise our reasons afterwards. Other decisions may be made more logically. Not everyone agrees with them, and I’m not sure if I do completely, but there is good evidence for what they say. Haidt decided to investigate this question by considering books by three atheists with strong anti-religion views – Sam Harris, Daniel Dennett and Richard Dawkins. As a comparison, he also analysed books by three politically right wing writers who are not regarded as scientific and three scientists (including himself) who write about religion but are not anti-religious. Subsequently, he analysed a number of other books, 30 in all, to strengthen his initial analysis. His idea was to test his hunch that anti-religious scientists wrote with greater certainty than other scientists, indicating that they were approaching the topic more argumentatively than with reason. Haidt used a text analysis program to count specific words and phrases that indicated certainty (e.g. always, never, no doubt) and expressed the total as a percentage of the total words in each book. This is admittedly a rough estimate as some of the words could be used to indicate views the writer didn’t agree with; nevertheless it gives an indication. Later he did a second run using a stricter list of ‘certainty’ words. The results tended to confirm his suspicions. 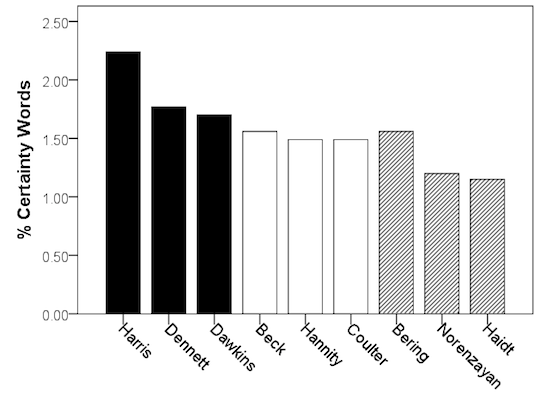 In the initial test of nine authors, the three ‘new atheists’ used more ‘certainty’ words (especially Sam Harris), the three more neutral scientists used the least, and the right wing commentators were in the middle. Use of ‘certainty words’ – taken from Haidt, 2014. The results for the more limited list of words gave similar results, though one right wing author (Beck) was now second highest. The highest average score for an author was for christian writer GK Chesterton (2.85), followed by Sam Harris (2.3), Martin Luther (2.26) and the inaugural speeches of US presidents (2.18).The lower end of the range were Norenzayan (1.21) and Haidt (1.25). Overall, the books by Dawkins and Dennett were in the top half of the list, the right wing authors were in the middle and more neutral scientists were in the lower half. This very rough analysis suggests that the new atheist writings express certainty in a similar way to religious writers Chesterton and Luther, and very differently to other scientists writing on religion. Sam Harris has responded to Haidt’s analysis, pointing out how use of certain words doesn’t necessarily indicate state of mind, and giving an example where he was persuaded by reason to change his mind. He finishes with a clever paragraph using many of Haidt’s ‘certainty’ words. Harris comes out of this sounding quite reasonable and open-minded. It seems to me that he tends to use stronger language even when not arguing. The change of mind example he gives suggests to me that he formed his initial opinion too quickly, argued it strongly, then reversed his view on the basis of one extra input. I don’t think I’d want to pin too much on this simple analysis. But as Haidt says, it can confirm suspicions – in this case that Harris, Dennett and Dawkins don’t appear to write objectively about religion, but argue beyond reason to support opinions they already hold. Not much of a surprise there – it’s something we all do when we talk about religion and ethics. But it suggests their writings should be categorised as ‘religion’ rather than ‘science’. It also throws light on two other authors who claim great certainty for themselves. Christians vs atheists: what type of person do you want to be? and Rational thinking is over-rated? on this website. Neurologist Robert Burton on certainty. Filed Under: Belief Tagged With: Atheism, Belief, People, Reason, What is human?